Grandin, M, P.-L. Blelly, O. Witasse and A. Marchaudon, (2014), Mars Express radio-occultation data: A novel analysis approach, J. Geophys. Res. Space Physics, 119, doi:10.1002/2014JA020698. The early-access version can be found here. The Mars Express Radio Science (MaRS) experiment on board Mars Express has been providing radio-occultation data since early 2004. The analysis method currently used to retrieve neutral atmosphere and ionosphere profiles is based on the resolution of a complex inverse problem. The solution to such a problem is obtained under strong assumptions on the atmosphere and the ionosphere and with some limitations. Here we developed a novel method for radio-occultation data analysis based on a direct approach which overcomes some of the difficulties related to the standard inversion. This new method is based on a numerical model of the atmosphere and the ionosphere of Mars computing the propagation of the radio waves from the spacecraft to the receiver on Earth. The main interest of such an approach lies in the intrinsic and coherent coupling between the neutral part and the ionized part of the planetary environment, which gives physical constrains on the retrieved profiles. We have applied this new method to radio occultation experiments performed by MaRS, and we present the results obtained in two different occultation configurations. We discuss the differences which emerge from the standard analysis and the gain that such a method can give to the analysis of planetary environments. Heikki Nevanlinna on kirjoittanut kirjan Sodankylän geofysiikan observatorion ensimmäisestä johtajasta Jaakko Keräsestä (1883-1979). Hän tuli koko kansalle paremmin tunnetuksi Ilmatieteen laitoksen johtajana, aikansa mediahahmona "Sää-Keräsenä" ja "Suomen Sääprofessorina". Ystävällisesti joulupukki toimitti kovakantisen version minulle. 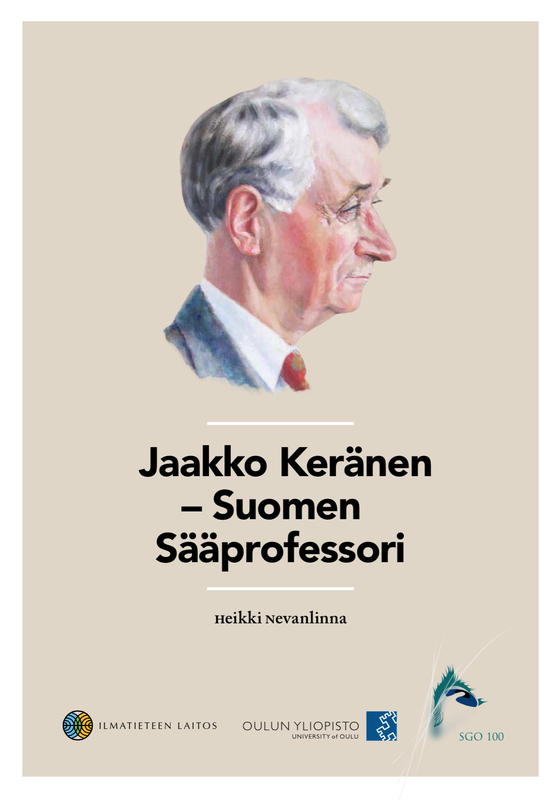 Sähköinen versio pdf:nä löytyy täältä: https://helda.helsinki.fi/handle/10138/144225. 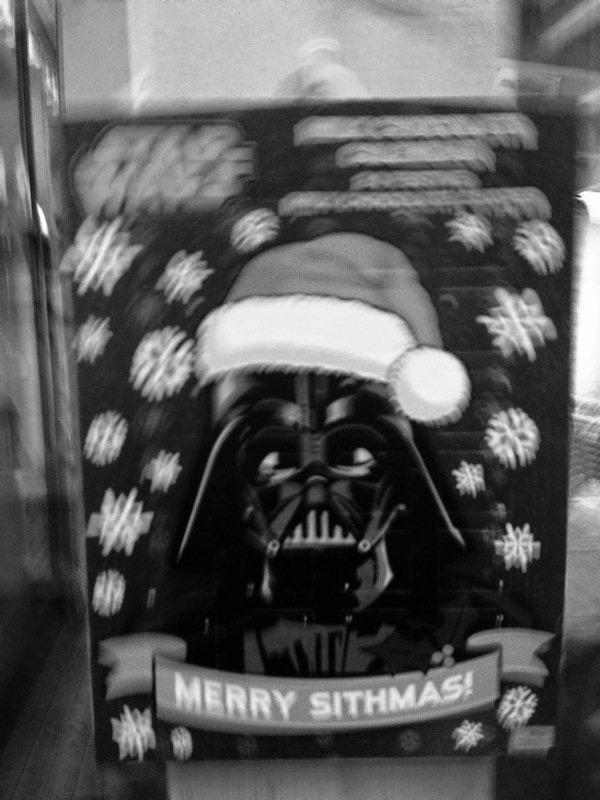 Eli jos sadan vuoden takainen observatoriomaailma ja Ilmatieteen laitoksen historia kiinnostaa, niin tässä varsin mielenkiintoista joululukemista. Kirjan on kustantanut Ilmatieteen laitos ja Sodankylän geofysiikan observatorio. Jaakko Keränen oli kotoisin Kainuun Paltamosta maanviljelijäperheestä. Keränen nimitettiin silloisen Ilmatieteellisen keskuslaitoksen magneetikoksi vuonna 1911. Sääosaston johtajaksi hänet valittiin vuonna 1921. Sitä ennen hän oli tehnyt mittavan työn Suomalaisen Tiedeakatemian Sodankylän magneettisen observatorion ensimmäisenä johtajana 1913–1918. Keräsen tehtäviin kuului myös Suomen alueellinen magneettinen kartoitustyö, joka valmistui 1930-luvun alussa. Kyseessä oli osa suuresta kansainvälisestä maapallonlaajuisesta tutkimusohjelmasta. Sodankylästä Keränen siirtyi kolmeksi vuodeksi geodeettiseen laitokseen, missä hän osallistui Suomen ja Neuvostoliiton välisen Tarton rauhansopimuksen (1920) mukaisiin rajanmääritysmittauksiin Lapissa. Tasavallan presidentti nimitti Keräsen Ilmatieteellisen keskuslaitoksen johtajaksi vuonna 1933. Ilmatieteellisen keskuslaitoksen johtajan tehtävistä Keränen siirtyi eläkkeelle vuonna 1953, mutta hän jatkoi meteorologian ja geofysiikan tiedeyhteisöissä eri tehtävissä vielä 1960-luvulle saakka. Jaakko Keräsen yli 20 vuotta kestäneen johtajakauden aikana Ilmatieteellisen keskuslaitoksen tehtäväalue laajeni merkittävästi ja henkilökunnan määrä kasvoi lähes kymmenkertaiseksi. Lentoliikenteen alku 1920-luvulla toi laitokselle uusia ilmailumeteorologisia tehtäviä. Yleisradiotoiminnan käynnistyminen avasi laitokselle uusia mahdollisuuksia meteorologisten tietojen välitykseen. Jaakko Keränen tulikin tunnetuksi kansalaisille radion ja myös sanomalehtikirjoitusten kautta ilmatieteen symbolina ja mediahahmona, "Sää-Keräsenä" ja "Suomen Sääprofessorina". Jatkosodassa 1941–1944 Keränen johti Ilmatieteellisen keskuslaitoksen toimintaa osana Puolustusvoimien koko maan kattavaa sääpalvelua. Sodan jälkeen Jaakko Keränen vaikutti merkittävästi Sodankylän magneettisen observatorion uudelleenrakentamiseen. Observatorio tuhoutui täysin Lapin sodassa 1944. Keränen oli myös keskeinen henkilö, kun Ilmatieteellisen keskuslaitoksen Sodankylän aerologinen observatorio perustettiin vuonna 1949. Hänen johtajakautensa lopulla käynnistyi myös Nurmijärven magneettinen observatorio. Jaakko Keränen oli aktiivisesti mukana Suomalaisessa Tiedeakatemiassa, jonne hänet valittiin vuonna 1926. Hänelle myönnettiin Suomalaisen Tiedeakatemian kunniapalkinto vuonna 1962. Keräsen tieteellinen tuotanto käsittää noin 170 julkaisua, jotka liittyvät lähinnä geomagneettisiin ja meteorologisiin aiheisiin. 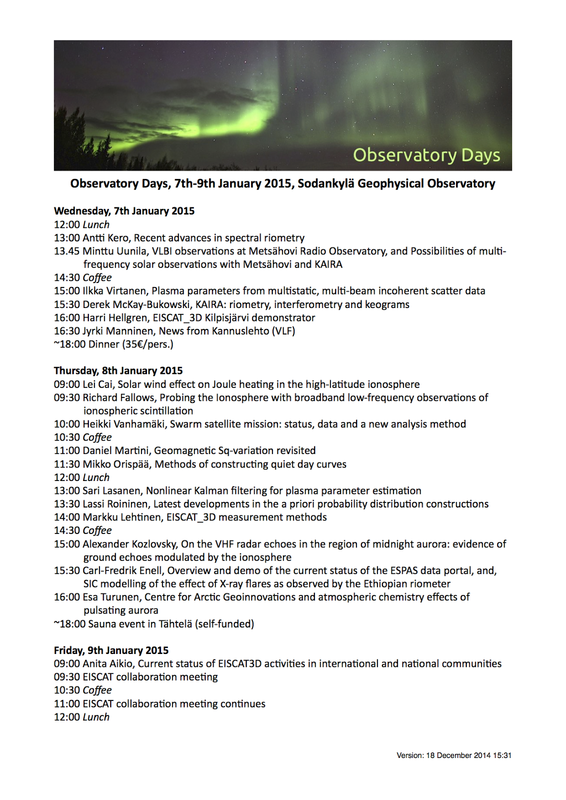 We have drafted the programme for the Observatory Days 2015. You may find the programme below. 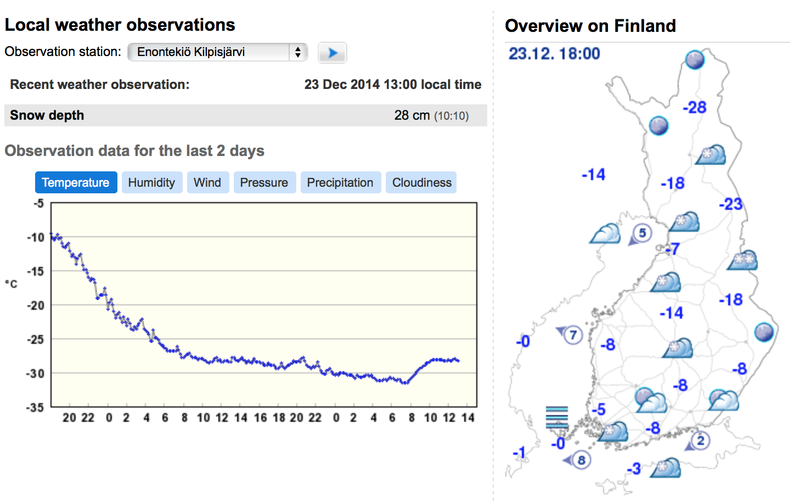 The event shall take place in Sodankylä Geophysical Observatory 7th-9th January 2015. All the talks will be in the Polaria lecture hall. The event website is here. Please note that if there will be further changes in the programme, the updated version will be only in the event website! 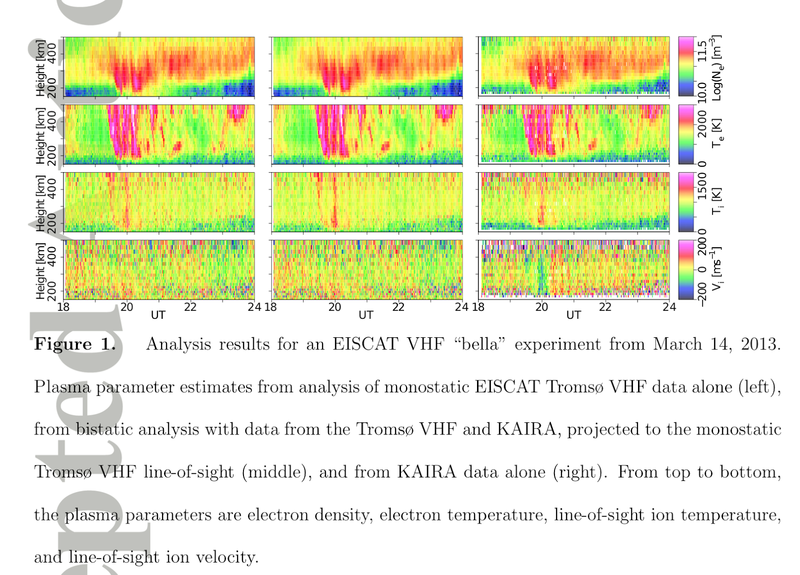 I. I. Virtanen, D. McKay-Bukowski, J. Vierinen, A. Aikio, R. Fallows and L. Roininen, Plasma parameter estimation from multistatic, multibeam incoherent scatter data, Journal of Geophysical Research, DOI:10.1002/2014JA020540. Multistatic incoherent scatter radars are superior to monostatic facilities in the sense that multistatic systems can measure plasma parameters from multiple directions in volumes limited by beam dimensions and measurement range resolution. We propose a new incoherent scatter analysis technique that uses data from all receiver beams of a multistatic, multi-beam radar system and produces, in addition to the plasma parameters typically measured with monostatic radars, estimates of ion velocity vectors and ion temperature anisotropies. Because the total scattered energy collected with remote receivers of a modern multistatic, multibeam radar system may even exceed the energy collected with the core transmit-and-receive site, the remote data improves the accuracy of all plasma parameter estimates, including those that could be measured with the core site alone. We apply the new multistatic analysis method for data measured by the tristatic EISCAT VHF radar and the KAIRA multibeam receiver and show that a significant improvement in accuracy is obtained by adding KAIRA data in the multistatic analysis. We also demonstrate the development of a pronounced ion temperature anisotropy during high-speed ionospheric plasma flows in substorm conditions. Figure 1 from the Virtanen et al. paper showing some of the results obtained. 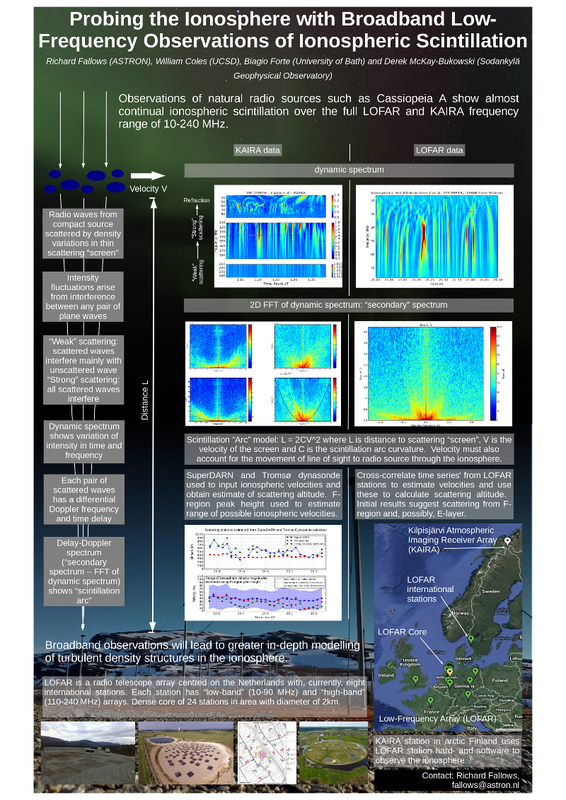 This week, the first KAIRA paper detailing the ionospheric scintillation observations we've been performing, and the "scintillation arc" phenomenon we've noted in the KAIRA blog (http://kaira.sgo.fi/2014/07/ionospheric-scintillation-arcs.html) was accepted for publication in the Journal of Geophysical Research. The image shown is of a poster presented at the recent European Space Weather Week which summarises this work, along with a few more recent results taken with LOFAR. The abstract of the paper follows and the full work can already be found online (http://onlinelibrary.wiley.com/enhanced/doi/10.1002/2014JA020406/). Intensity scintillations of cosmic radio sources are used to study astrophysical plasmas like the ionosphere, the solar wind, and the interstellar medium. Normally these observations are relatively narrow band. 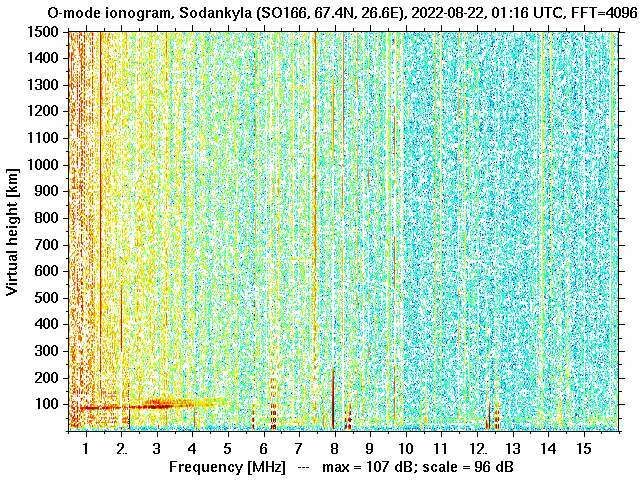 With Low Frequency Array (LOFAR) technology at the Kilpisjarvi Atmospheric Imaging Receiver Array (KAIRA) station in northern Finland we have observed scintillations over a 3 octave bandwidth. “Parabolic arcs”, which were discovered in interstellar scintillations of pulsars, can provide precise estimates of the distance and velocity of the scattering plasma. 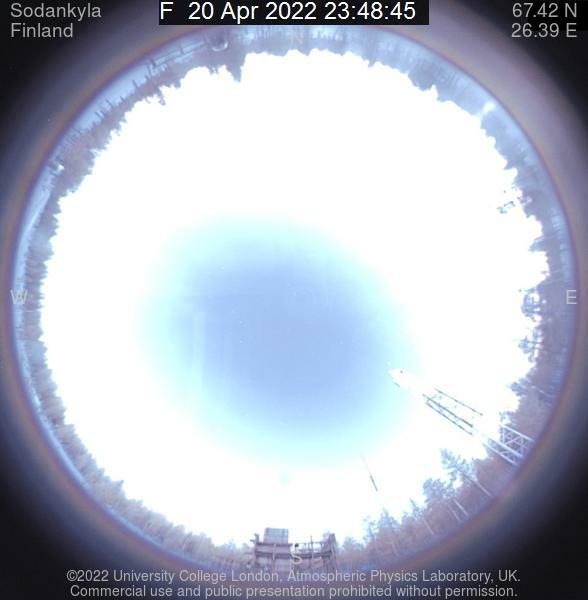 Here we report the first observations of such arcs in the ionosphere and the first broad-band observations of arcs anywhere, raising hopes that study of the phenomenon may similarly improve the analysis of ionospheric scintillations. These observations were made of the strong natural radio source Cygnus-A and covered the entire 30-250 MHz band of KAIRA. Well-defined parabolic arcs were seen early in the observations, before transit, and disappeared after transit although scintillations continued to be obvious during the entire observation. We show that this can be attributed to the structure of Cygnus-A. Initial results from modeling these scintillation arcs are consistent with simultaneous ionospheric soundings taken with other instruments, and indicate that scattering is most likely to be associated more with the topside ionosphere than the F-region peak altitude. Further modeling and possible extension to interferometric observations, using international LOFAR stations, are discussed. Today is the first day of Advent. It is also our first day in SGO without Iina Sirviö, who completed her bachelor thesis last Friday and therefore moved back to Jyväskylä for her studies. But before leaving, as she knows that chocolate is generally a good remedy against yearning, she offered a nice Advent calendar to all of us. Now, all we need to do is find a fair way to share the chocolates equally, taking into account each one's trips and holidays. Kiitos, Iina, ja nähdään pian!